HandKrafted by Stephanie: SCRS Challenge #28 -- Hi There! SCRS Challenge #28 -- Hi There! Hello! I'm settling back into my routine after a fun trip to CA for the Craft & Hobby Association (CHA) Conference & Trade Show. It was my first time attending, and I had a lot of fun walking the floor, looking at all the new products and meeting people that I only knew from online.. LOL! I went with my sweet friend Mona, and I had a great time spending a girl's weekend away with her.. :) I even had the chance to meet some of my past and present SCRS teammates -- Sparkle, Kim, Shaela, and Lisa! Speaking of SCRS, it's time for an all new Sparkle Creations Rubber Stamps Challenge! Each week we will post an all new challenge at this time (9 PM PST on Mondays). For all the details, please visit the SCRS blog. 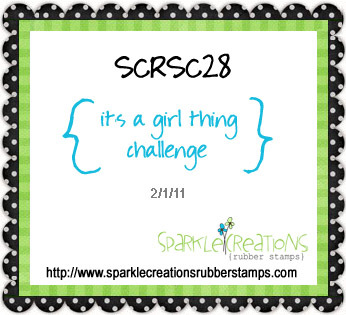 This week's challenge is "It's a Girl Thing" (create anything girly girl). This is our first SCRS challenge for the month, so we have a new Guest Designer... please welcome the uber-talented, Amber Hight! I love Amber's design work and amazing color skills, so I am thrilled she could join us this month! This is also the first official start for our new DT members, Alice and Shaela! We are so excited to have them join our team .. you can see their creations as well as the rest of the team's on the SCRS blog and on their individual blogs (links below my project). 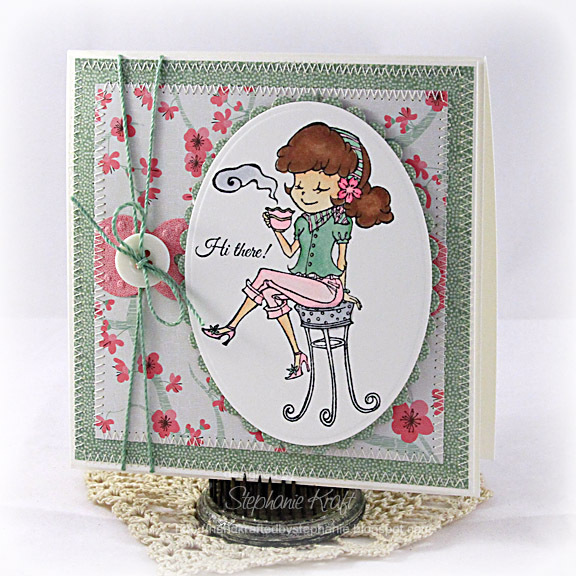 I used Cafe Lucy on my card today and paired her with some yummy paper from Imaginisce Garden Party (love the pink and greens in this!).. My sentiment is from Verve's Wordy Birds. I kept my embellishments to a minimum, but I did add some yummy Simply Sage Baker's Luster Twine from Pizzazz Aplenty.. it has a lovely sheen to it and is still thin enough to thread through buttons.. LOVE that! Accessories: Petite Oval and Scalloped Petite Oval Nestabilities, Big Scalloped Borderabilities Petite (Spellbinders); Markers (Copic), Button, Baker's Luster Twine (Pizzazz Aplenty), Foam tape, Thread, Sewing machine. Super cute, Stephanie! Love all the stitches! It was great meeting you! Too bad we didn't get to chat much. :( Hopefully we get to meet one day soon again! I sure had a blast this weekend Stephanie at CHA! Thanks again :) This card is so sweet! Great job coloring that darling image and I love the aqua baker's twine! Sooo sweet...love the cute image! She is DARLING Steph!! LOVE these papers with her!!! Such a lovely card! Those papers are so sweet with her and your stitching is always so gorgeous! Love the papers!! this is a super sweet card. so pretty! love the colors and the stitching details! beautiful card, Stephanie! Sweet card! Love the pairing of papers and matching twine. Glad you got to hang out with Mona at the show! Sounds like you had a great time. Gorgeous card Stephanie!!! Another beautiful creation!